Criticize Palm Coast City Manager Jim Landon all you like: he knows how to negotiate a contract beneficial to the city he serves. He showed it with the Waste Pro contract the Palm Coast City Council ratified unanimously Tuesday evening, almost a year after a tortuous process began to renew the city’s 5-year, $7 million deal with the trash hauler. The coup for Palm Coast was not the negotiated monthly price, which will fall, modestly, to $18.77 a month, a $1.53 a month drop from the current charge (you’ll see the new charge beginning June 1. That charge includes a 10 percent tax, or “franchise fee,” the city imposes, to generate extra revenue. The monthly bill would be about $1.8 a month lower, or around $17 a month, without the tax). Nor is it the other benefits that would have likely been part of any new contract, as demanded by the city, including once-a-month hazardous waste pick-up and “single-stream recycling,” which means that residents no longer have to separate their plastics and cans from their paper products before putting out their bins. The coup, generously enabled by Waste Pro, was a long-term deal likely to yield big dividends for the city if and when it moves much of its large fleet (of some 258 vehicles) away from gasoline and diesel to compressed natural gas. Recent discoveries have added to an enormous domestic natural gas supply, suggesting far more stable, or lower, prices for that fuel in the future than either gasoline or diesel. Waste Pro, in a partnership with T. Boone Pickens, the wealthy financier and energy magnate who’s been campaigning for natural gas conversion for years, is investing $100 million to convert its fleet to compressed natural gas, or CNG, vehicles. Waste Pro’s contract with Palm Coast calls for the company to have built a compressed natural gas fueling facility at its Bunnell location at 401 South Bay Street by June 1 next year. The natural gas filling station will be made available to city vehicles, if and when the city converts to such vehicles, at the same price the supplier charges Waste Pro. In other words, Waste Pro is not to profit from gassing up Palm Coast vehicles. Palm Coast could theoretically focus on converting its flee without worrying about a supply source, or a fueling station, both of which would have been expensive. In addition, Waste Pro is to make its fueling station available to other local governments, such as the school board, should those vehicles be converted. The long-term savings for the city could be considerable. The green-energy benefits of moving away from diesel or gasoline would be an added advantage: natural gas releases about half the greenhouse gas emissions that gasoline and diesel do, and burns more efficiently. By June 1, 2013, the monthly billing charge to residents should also fall by 15 cents, to reflect the hauler’s switch to natural gas vehicles. And that price will not fluctuate from that point on, Diane Torino, the city’s purchasing manager, told the city council Tuesday evening. Ironically, that could cut both ways: natural gas prices have been in a free fall because of the oversupply. So the city could find itself paying Waste Pro inflated fuel costs down the line. Other additives to the new contract include doorstep hazardous waste once a month, on Saturday, by reservation, through direct contact with Waste Pro. Items that may be picked up include batteries, fluorescent light bulbs, motor oil, paints, household cleaners, herbicides and pesticides, but not commercial or industrial type hazardous waste. And not medicines. Those would be left at the front door or the garage door, not at curbside. Then there’s the Big Brother bin: The city is giving Waste Pro a list of all the names and addresses of residents in the city. The information will be programmed into a computer chip, individualized to each household. That chip will be affixed to the 18-gallon recycling bin Waste Pro is providing households, free of additional charges (the cost is built into the contract). Every time a resident places the recycling bin at curbside for pick-up, Waste Pro will scan the chip to certify that the household is recycling. That makes the household eligible for the “Recycling Rewards Program,” essentially a value coupon system: residents can redeem the coupons at participating retailers and other businesses, based on the residents’ level of participating in recycling. For example, all residents, whether they recycle or not, will get a base level of coupons because they’re getting billed for garbage pick-up. But those who set out their recycling bin at least once a month get a higher-value coupon (in the range of a dollar off for some items). Every three months, Waste Pro will hold a drawing involving all those who’ve participated actively. Prizes include electronic devices such as iPads and televisions. It’s not, of course, mandatory that residents stick the chip to their bin. When the contract went out to RFP it was pretty clear to me that no one else was welcome to bid. Landon opened the bid but kept things private. We all were played as fools. This deal after all the Landon moves and now the spin on the positive publicity make me even sicker. Republic Service walked away from the bid because it was too restrictive. How do you make the number 2 biggest garbage company walk away. Oh by the way Republic uses mostly natural gas trucks so this concept is nothing new. Landon and his followers makes you think that Waste Prowhois nothing but a small regional company is the answer to picking up garbage. What bull, we got scammed, I tried to warn you all and once again the 200k man gets his way at the cost of the tax payer of Palm Coast. You may think that the $1.00 extra we are charged for the Hazard household waste is a cheap add on but let’s do the math. 60,000 homes a month = $60,000. Now do ya really think that 60,000 homes will put out Hazard household waste weekly. Heck we don’t even recycle good enough. Did you ever watch the garbage trucks throw clean cardboard in the back to go to the dump? so this $1.00 goes straight to the profits of Waste Pro and the 10% franchise fee the city makes on this is $6k MONTHLY. Just on the Hazard House Hold Fee. What bull!!!!!!!!!!!!!! Why or how? Waste Pro just adds the 10% fee to YOUR BILL TO THECITY> DO Ya Feel duped YET PALM COAST RESIDENTS……………………………So big deal keep your recycle rebates your charging us for those coupons too……………….Landon and the City council nothing but a bunch of con-men!!!! Some of the would be bidders did not want to meet the requirements of the bid and removed themselves from the bidding. For example, one vendor insisted that he be allowed to use the 96 gal. trash containers which could be picked up using automation (if properly placed). This did not meet the city’s criteria. The bidder then removed himself from the bidding. Some obviously have no clue about requests for proposals (RFPs) and contract law. When one develops the aforementioned you have to plan for things such as every household putting out hazardous materials, even if only a few participate. I could go on and on here but I think it is a good thing if people can save money. Let’s just be a skeptic , for the heck of it. Would the City have received such “beneficial ” secondary items IF the contract was not bid out to all the parties? I do not believe we were given any information on such items, as possible add ons, when Mr. Landon wanted to enter negotiations directly with Waste-Pro. I would suggest, that some of these, were not thought of initially, and were derived by some counselling of the successful bidder. Infact, this same tactic( I called it counselling) was seen just recently, when an auditing company, just “HAPPENED” to come up with a suggestion to replace our 1/2 cents sales tax with a franchise tax on all resident utility bills. This auditing company, which isn’t an actual FORMAL AUDITOR, of our books, has been conducting audits of our books, or practices, for many years, and they just happen to think of the change now? This same audit company, which is actually an Association, awards 90% of the budget submissions by a City or County with an award. But there I go again, with being skeptic….Bottomline, the contract seems good for Palm Coast, and does show, that ‘hidden taxes” are out there, but it will take time to find them all. Yet we are told, that our property taxes are low. I have lived here in Palm Coast for almost 20 years. Waste Pro workers have always done their job. Sometimes my trash cans were not neatly put back on my driveway, but have always removed my trash and recycled items. If you tip them on Christmas they will look out for you and take extra debris if you have it. I will keep the dollar a month and if i have any Hazard household waste i will take it to the old land fill where the county has a drop off area for free!!!! for flagler county residents .Why pay for a free service that has been around for years . Am I the only one that sees that this Natural Gas thing is a trap that the city is entangling itself in? Great, they buy the vehicles and use Waste Pro’s station to fuel them. Then the contract comes up for renewal…and Waste Pro has the city over a barrel (no pun intended) because the city has become dependent on Waste Pro’s Natural Gas fueling service. Waste Pro isn’t doing the city a favor…they are a dealer giving a future junkie their first taste. 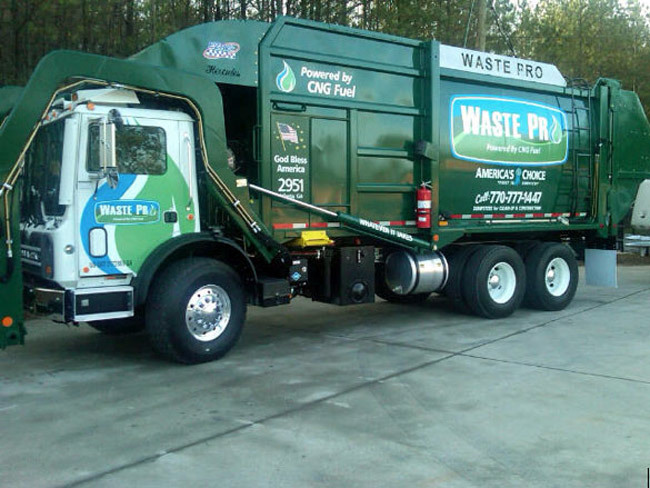 Waste Pro, in a partnership with T. Boone Pickens, the wealthy financier and energy magnate who’s been campaigning for natural gas conversion for years, is investing $100 million to convert its fleet to compressed natural gas, or CNG, vehicles. While forever bitter over T. Boone’s despicable Swift Boat Lie Fest…pretty darn happy Palm Coast joining the 21st Century with this natural gas conversion. Now if they could only invent quiet brakes for these trucks…yeeeeessssh! Only other lingering thought on this topic is why did Waste Mgmt bow out of bidding on our account last year? It was supposed to be an RFP. It turned out to be nothing but a hoax. A con fabricated by the city manager Landon. Landon has no interest in saving the resident any money. It is clearly evident that his continued creative was of keeping the city revenues up is going to cost the resdents. We are slowly becoming one of those communities that will be too costly to live in like Palm beach or Boca Raton. Where those two cities use the same revenue producing results. Now it is an expensive place to live and work. Palm Cost services will continue to cost more and more. Get bigger and bigger at the expence of the resident. Realize what i’m say Mr. McGuire it started with a fictional RFP. were just a savings of about a dollar. The additional service of CNG trucks cost alot of money the CNG fueling station ill cost 500-700k to build. The recycling rebates cost money to have and manage the program. The GPS system will cost several thousand dollars. All these demands cost money. and who is going to pay for all of this? Waste Pro really? Your paying for it with the Hazard Household waste program. People are to lazy to use the program. However the city will collect that Hazard household fee , even if you don’t use the service. How about finding ways to save money through efficency and good management practices. This is not how Landon works when will this council see this? Stop taxing the residents and businesses with more of these con man RFP’s is my suggestion. One last thing I have an easy way Palm Coast can save about 200k………. What do you think this may be? Mr. Landon had nothing to do with what is is the contract, if you remember he only wanted to renew with the current provider. Landon will get credit that he does not deserve, if there was not a outcry from the public he would have just renewed with a 3% increase no questions asked. It was because of the other bids that came in that made Waste Pro go lower and add more in the their service contract. They had no choice but to go lower to insure they recieved the renewal. the contract was rigged by the city to ensure Waste Pro was awarded the new contract. They worded it in such a way that no other provider could compete, and to fix a tie it was listed as experiance counts most; experiance where? apparently just in the City of Palm Coast. The other Three bidders all have more experiance than Wate Pro but not in the city of Palm Coast, please do not pat Landon on the back for this deal. If it were up to Landon we would all be paying even more for our trash removal, Waste Pro never offered to lower the bill previously, and a funny thing about Waste Pro; they built a new facility 10 months before the currant contract expired. A new 3 million dollar facilty less than a year before your contract expires, sounds fishy to me; maybe you can give Mr. Landon cedit for that. You said perfectly. No saving just hype. does anyone realize that were paying extra for Hazardous Household pickup when we aleady pay in our property taxes to the county the ability to bring our hazardous househould waste to the old landfill for free. I should say no fee when you go there if you are a Flagler county resident. So we get dinged twice on this one. Landon makes me sick…………..